DNA, which stands for Deoxyribonucleic acid, is made up molecules known as nucleic acids. These were first identified by Swiss physician and biologist Johannes Friedrich Miescher in 1869, who called them “nuclein” because they were found in the nucleus of the cell. Every type of life form known contains nucleic acids, in the form of DNA or RNA (ribonucleic acid). Oswald Avery received the Nobel Prize in 1943 for confirming that DNA carried genetic information. Each strand of human DNA is divided into 23 pairs of chromosones, which in turn contain hundreds or thousands of genes. Genes record information in the form of chemical codes about how to build the proteins and other molecules which make up living organisms. DNA is one of the longest type of polymers, or chains of molecules. Strands of human DNA are 6 feet long. In 1950, scientist Rosalind Franklin used X-ray crystallography to find that DNA is made up of two long polymers, or chains of molecules, twisted into a shape called a double helix. In 1953, James Watson and Francis Crick discovered that the strands were connected by crossbars, like a ladder. They won the Nobel Prize in 1962 for uncovering DNA’s structure. Cells from the inside of your cheek mix with the salt water and are carried away when you spit. Above is a photograph of cheek cells under a microscope. You can see the nucleus inside each cell. Put a drop of dish soap on the plate. Touch the spoon to the soap, and then dip it in the cup of salt water. Gently stir once or twice. Cells are contained within membranes that are made up of fats. The soap solution breaks down the fat molecules, just like soap breaks down grease on your dishes, and releases the contents of the cell. Remove the alcohol from the freezer. Pour about a quarter of a cup into a second plastic cup. If desired, add a drop of blue food coloring to make the alcohol easier to see. Stir until evenly mixed. Take the salt water cup and tilt to one side. Hold the cup of alcohol up so that the lip touches the tilted cup. SLOWLY pour a little alcohol down the inside of the cup so that it floats on top of the salt water without mixing. Continue until there is about an eighth of an inch of alcohol on top of the salt water. Wait a few minutes and you will see long strands or clumps of a sticky white substance start to come together in the alcohol layer. 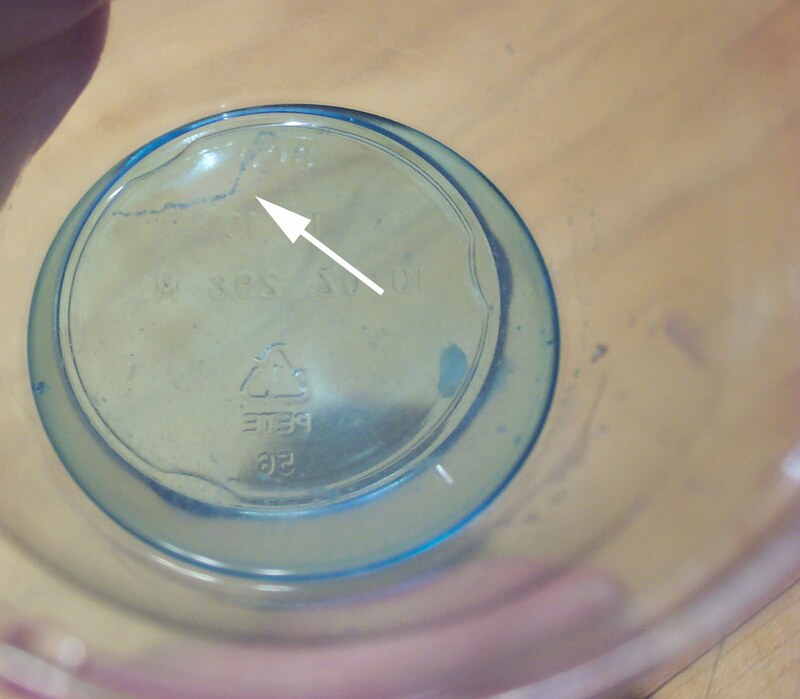 This is the DNA from thousands of cheek cells in the salt water. The DNA cannot dissolve in the chilled alcohol, so it precipitates out (comes out of solution as a solid). Variation: If you want to remove the DNA to look at it through a microscope, dip a toothpick into the alcohol layer and twirl it to gather up the sticky DNA. Place on a glass microscope slide. 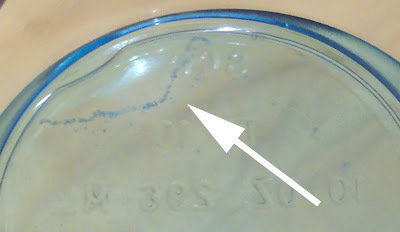 You can also save the DNA in a small clear container with a little extra salt water. Keep tightly covered.